Hello! Getting excited for the 4th yet?? I know I am! We don’t even have real plans yet, but I know it’ll be great no matter what happens. I mean, come one, GO AMERICA!!! This morning was another one of those lovely mornings where I was not exactly a happy little girl. I woke up in time to go running before work, had my work clothes on, and was ready to head out the door when I noticed I’d missed a call from my dad. Dang it! I realized that Keenan and I were supposed to go help him move a clothes dryer this morning. So, I gave up on my run, hauled Keenan out of bed, drove to my father’s house, and pouted like a little girl because I didn’t get to go running. We got back to our apartment with just enough time to shower and get ready to go (benefits of having food for work prepared beforehand.) At some point, I made the decision that I was going to drive to work instead of the usual public transport. I love getting to spend some extra time in the car with my boyfriend, especially on my grumpier days. He’s kinda awesome. I did miss breakfast/lunch in all the chaos, but I ate a peach on the road, and just dealt with being hungry until my first break at work. 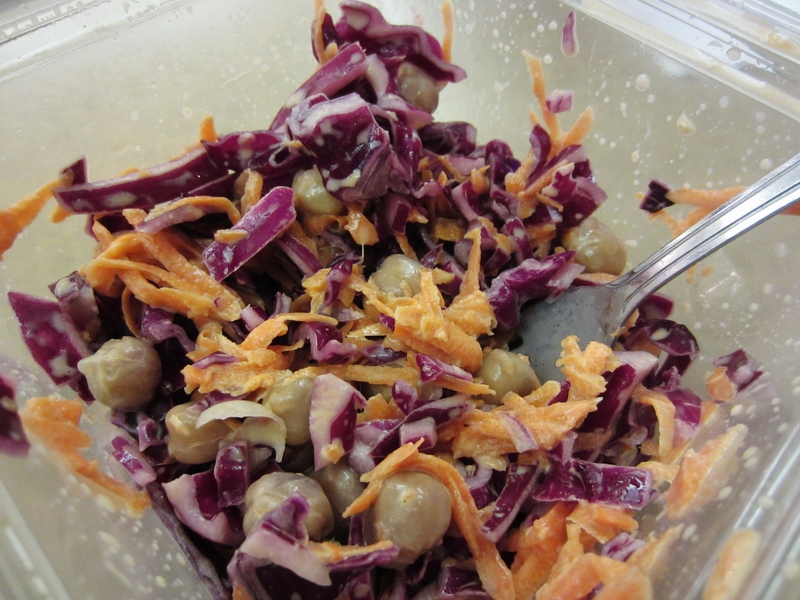 I brought some of my Red Cabbage Slaw with chickpeas to eat for my lunch. Definitely just as good the second time around. I will totally be making this again very soon! It’s just so easy and delicious! 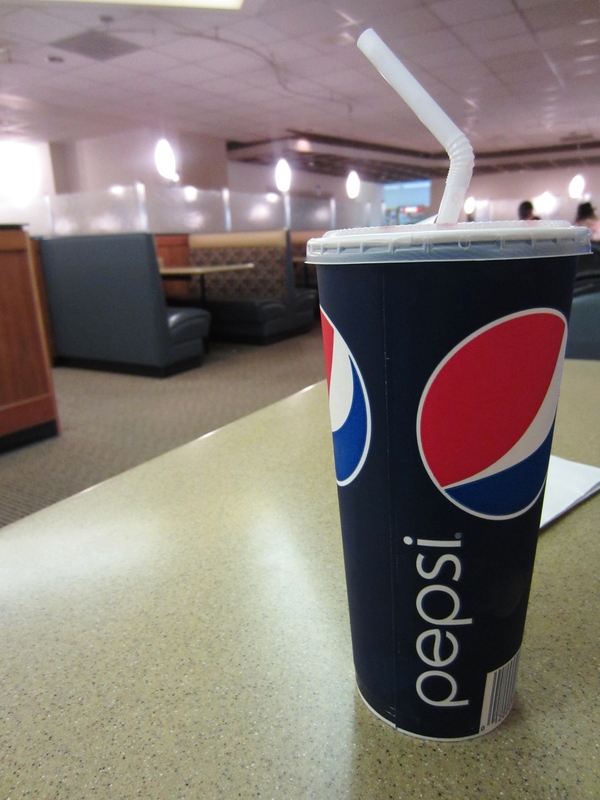 Along with it, I enjoyed a mix of fruit punch and Sierra Mist. I’m not usually a big soda drinker, but I was craving something fruity and fizzy to help wake me up when I got to work, and this really hit the spot. I continued sipping on this for the entire duration of my shift. 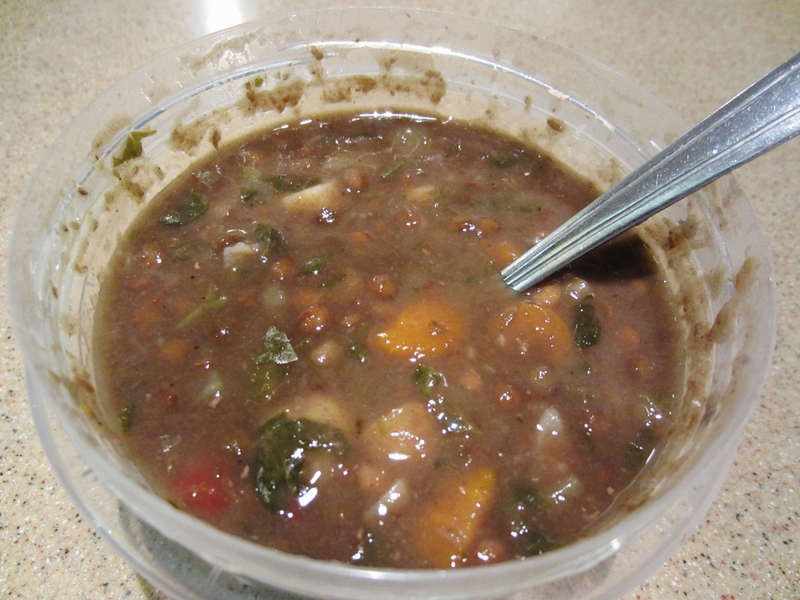 My second meal was a can of Wolfgang Puck’s lentil and vegetable soup. I think this is one of my favorite canned lentil soups. Lots of veggies mixed in with the lentils! What do you have planning for the 4th?? I have nothing planned as of yet. We’re definitely a bit along the spontaneous side when it comes to plans. It’ll be totally sweet though, no matter what we end up doing! Have a great night, and an amazing 4th of July!! PS. Check out this article from FitSugar- 20 Vegan Barbecue Side Dishes! Even if you’re a meat-eater, not EVERYTHING at your 4th of July BBQ needs to be loaded with meat and cheese! Good evening my loves! How’s it going on your side? I’m doing pretty well. Today was a pretty typical day at work. The only things that were atypical were my meals. I made myself a special treat yesterday in place of my usual salad that I am pretty darn impressed with. 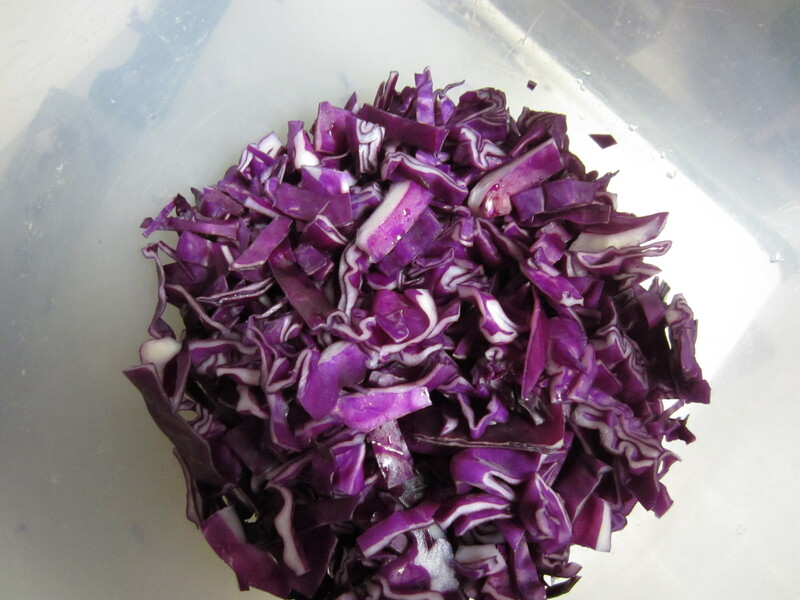 Introducing, Red Cabbage Slaw! 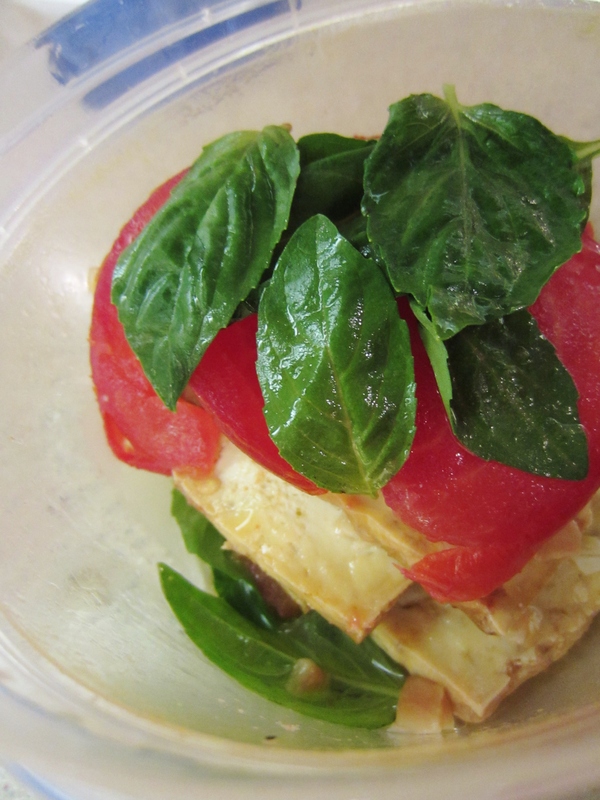 My second meal was the leftovers from my Vegan Caprese Salad from last night. Still just as tasty today! 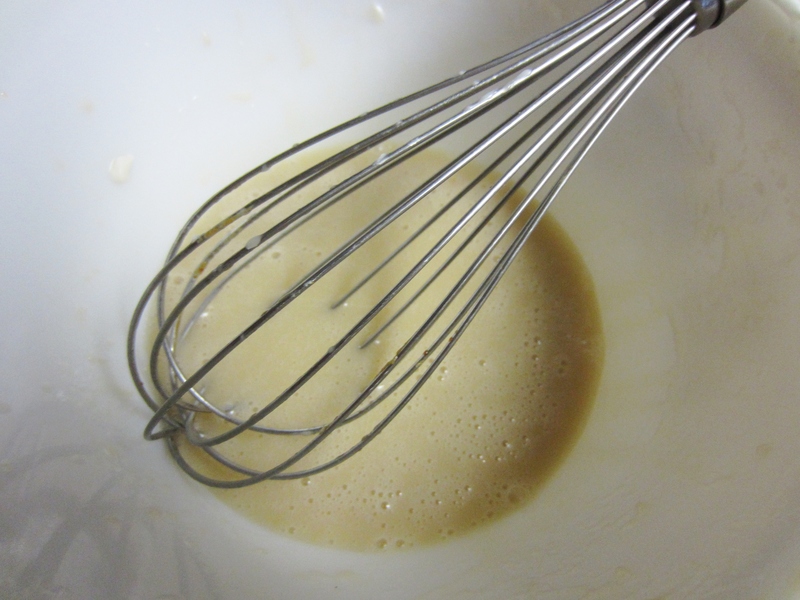 Anyway, time for my delicious recipe! 1. 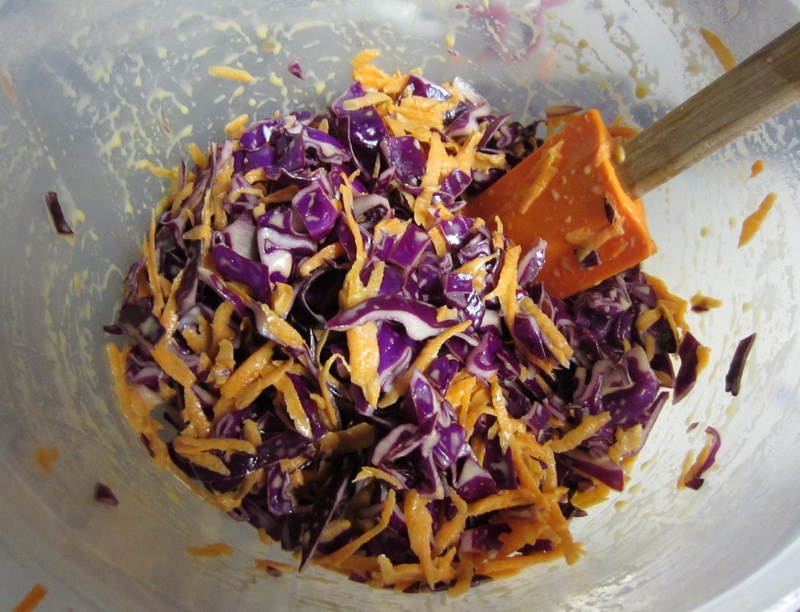 Put the shredded cabbage in a large mixing bowl. Add the carrot to the cabbage. 2. 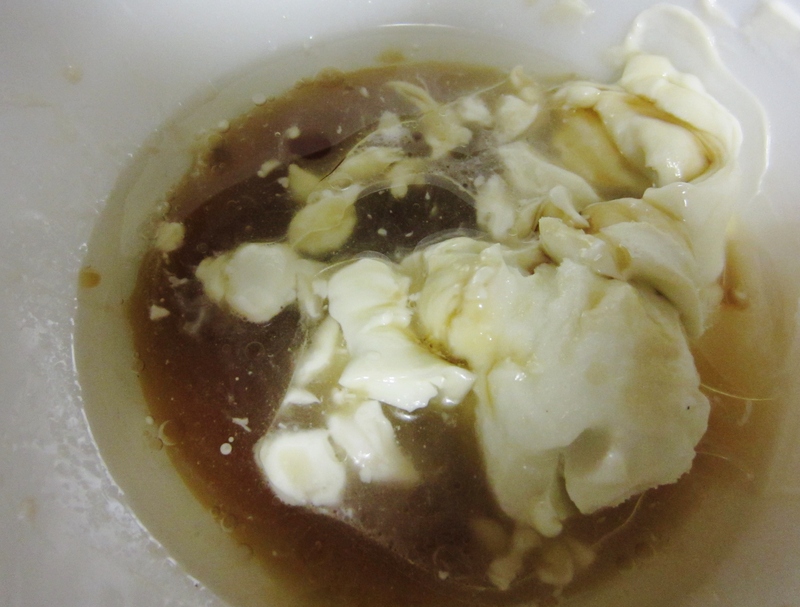 In a separate bowl, add the remaining ingredients. 3. 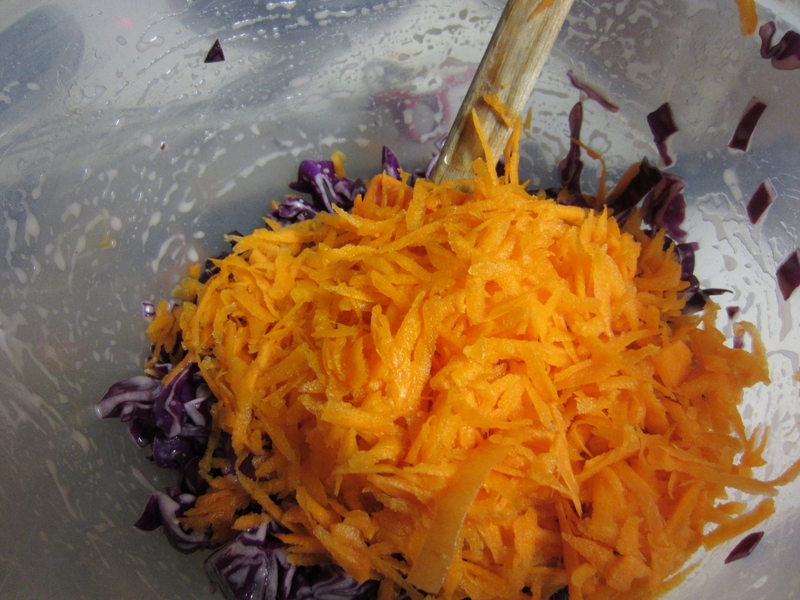 Add the sauce to the cabbage/carrot mix and stir until the veggies are well coated with the sauce. This recipe is slightly sweet and all natural. 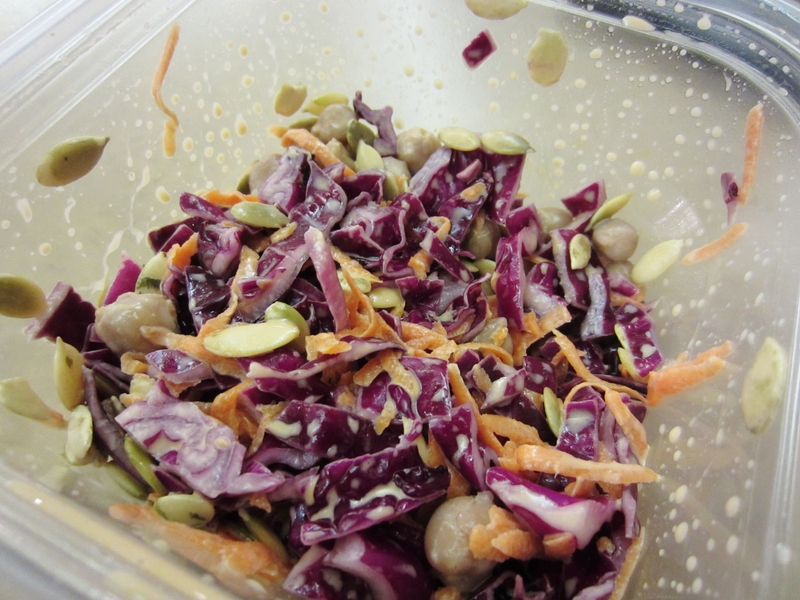 I really liked it because it gave me a huge serving of raw veggies, just like my regular salad, but having a completely different combo allowed me to get a different nutrient profile from what I normally have in my lunch salad. I’m definitely looking forward to consuming the other half of the recipe tomorrow! Now I am off home on the super crazy ferry (it always gets hectic on the nights that there are Mariners games). When I get home I plan on enjoying a quick snack and then going to bed. I am a tired girl!